Just...just look at it. I can't actually, I keep on thinking my eyes are being squeezed into getting the stripes wrong. 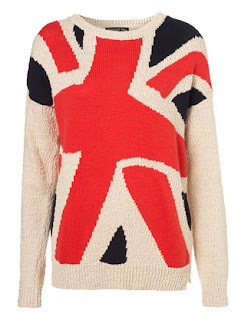 This Topshop jumper is plain cream on the back, and then has this...this take of the Union Jack on the front. Red, white and black. I can't decide whether this is genius, or hideous. Is it a really interesting reimagining of the flag, or just a bit like looking at a drunk disco filled with sunburned people and darkness? I'll leave this to you to decide, while my eyes finish burning in confusion and weird. Are we a little bit over stamping flags on everything? (We're not in the Spice Girls circa 1997, sadly). Or do you love this and plan on wearing it all through the Olympics? Decide while watching the most fabulous Union Jack dress in action. Take note, Topshop: flags should always come with a hint of 90s irony. I would normally be a firm nay on this one. HOWEVER, my dear sister bought this jumper and wore it to the athletics in Crystal Palace last weekend. I went to the pub with her after. Goldie Sayer - who had just smashed the GB javelin record - walked in and the pub turned into a mini celebration. In the middle of the flags and the face paint in the place, my sister could not have been more appropriately dressed. So, I'd say yay: but only if you are likely to bump into an Olympic competitor. Looks like a game of Twister on the front. Now I've seen that, I can't see the flag any more. No. Just no. Mainly because of the 90's connotations. All this 90's revival-ness lately is making me feel old! Also I agree that boobage will warp the flag even more. More importantly - how many crotch shots of the Spice Girls is needed in 4 mins 28 secs?